We specialise in bespoke setups suitable for road, track or race that include fully optimised corner weights. Whether you have a basic Roadsport or slick-shod R500, we will work with you to fine tune the ride & handling to your personal requirements. 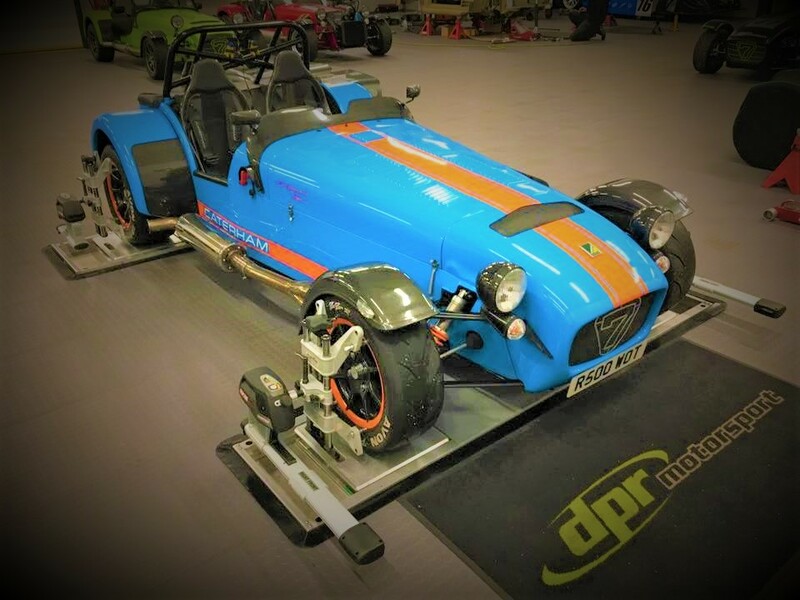 Our investment in the Pro-Align Hunter four wheel alignment system takes DPR setups to a new level of engineering excellence; our high-performance setup can be tailored for fast road, track, race, sprints or hill climbs. For road customers we provide a setup sheet that details the before and after measurements for toe, camber, ride height and corner weights and take local road conditions into account when adjusting ride height. Just a quick note to say thanks again for the work on my car on Saturday morning. Obviously I didn’t get much chance to test the handling characteristics on the way home (! ), but you completely sorted the heavy steering; it was an enormous difference — light and sensitive; completely different to how it was before. Some time ago you set up the suspension. I just thought I’d let you know that having got a couple of thousand miles on the car since then, I am very pleased with the set-up. It now really does “corner on rails” & rides bumpy roads much much better than before, many passengers have commented on how stuck-to-the-road it feels. The slight tendency to oversteer at the extremes has gone completely. Thanks again for making my car even better. Took my S3 for a full flat floor set up this week. The guys were very switched on, the workshop was immaculate and the car was treated with great care and attention from start to finish. Having been for a blat today the results feel positive. Would be happy to recommend them to any Caterham owner.